People from former communist and socialist (including India) world refer Bretton Wood institutions as some animal who extract blood like leeches. Reason for this particular hatred towards Bretton Wood institutions is due to the strict conditions they impose on countries (borrowers) who are applying for loans. Let me ask you one question, will any bank would give loan to any individual or institution without making sure that, borrower have sufficient capability to pay it back? What assurance IMF and World Bank have, when they give loans to countries which are on the verge of default? After all it’s the undisciplined economic policies, which brought those countries to the economic cliff in the first place. Today when I read Samir Saran’s article “Waking up to theBRICS” in 'The Hindu', I suddenly remembered all those accusations hurled against IMF and World Bank. 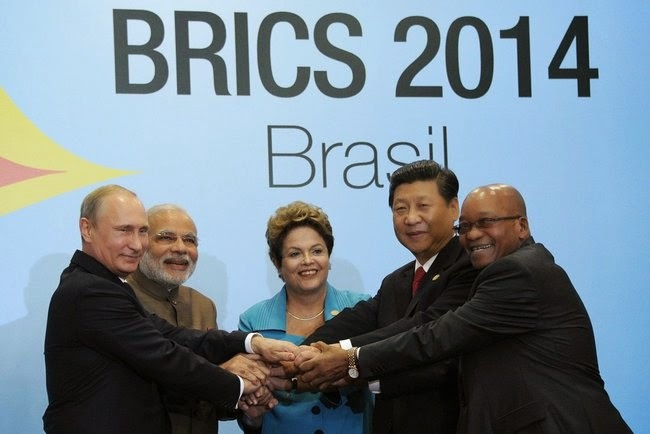 This article is basically in support of New Development Bank proposed by BRICS. I believe two points mentioned there demand a reply. Relation between bank and borrower is going to change? Well, I agree on giving more say to borrowing country in prioritizing projects. However, there is world of difference between normal banks giving loans to an individual and World Bank giving loans to sovereign countries. If financial institutions are not insisting on policy terms then what leverage they have? What is the guarantee that countries will move away from the dangerous path? Would India have changed her economic course in 1991, if IMF’s conditions were not there? If a country defaulted on repayment, then World Bank don’t have much chance to get the amount back any time soon. Hence, relationship between bank and borrower won’t undergo any radical change because of New Development Bank. Any bank worth its name will demand security – in the form of change in policies perused by borrower. Why Indian observers often fall back to GDP in PPP terms rather than looking at real facts? Is it because GDP in PPP terms is in favour of BRICS? It’s time for us to come out of the cocoon and face the real world.